For Americans who haven’t been to a state fair recently or who are unacquainted with Paula Deen’s style of Southern comfort food, this may come as a surprise: Some people make sandwiches with doughnuts. Now a doughnut sandwich is available for a lucky (or brave) few at none other than Dunkin’ Donuts (DNKN). 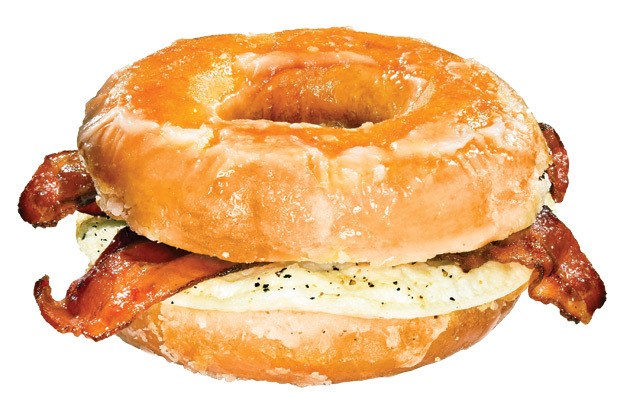 The chain is testing a Glazed Donut Breakfast Sandwich—there’s a pepper fried egg and cherrywood-smoked bacon inside—in about a dozen stores in the Boston area. Most fast-food chains have added a dish or two that could conceivably qualify as healthy and several that definitely wouldn’t. In March, Burger King began offering burgers stuffed with bacon and cheddar and topped with onion rings, as well as tater tots filled with bacon and onions. It also started selling turkey and veggie burgers. The bacon cheeseburger has 650 calories and 39 grams of fat; the veggie burger, served with mayonnaise, has 410 calories and 16 grams. Among the most successful in the more-is-more category of food is the Doritos Locos Tacos, which Yum! Brands’ (YUM) Taco Bell introduced a year ago. It has sold 375 million servings of the tacos, which feature the familiar flavors of the popular tortilla chip brand. “If those were around when I was in college, I would have eaten them all the time,” says Sam Oches, the 26-year-old editor of the trade magazine QSR (which stands for quick service restaurants). “They are for a very specific demographic.” The tacos are made with regular Taco Bell fillings and a specially created Doritos shell. Taco Bell started with a Nacho Cheese Taco; in March it brought out a Cool Ranch version. Now PepsiCo (PEP), which owns Doritos, is selling a Doritos Locos Taco-flavored chip for a short time this spring. Dude! Pizza Hut, another Yum! Brands unit, has found a way to deliver even more cheese to customers. The chain’s new pizza has 16 open-face pockets along the crust brimming with its Italian five-cheese blend. Before its introduction, the pizza was internally known as the Stuffed Italiano, which didn’t sound extreme, just strange. By early April, when it was launched for a limited time, it had become the Crazy Cheesy Crust Pizza. “You’ve got to somehow stimulate the imagination of the consumer if they are going to be at all interested in a product,” says Bruce Perkin, Pizza Hut’s chief research and development officer. Doug Terfehr, a spokesman for the chain, adds, “Young males like to try new things, and this product does a lot of what they like.” A slice has 340 calories; one-third of them come from fat. It’s not only fast-food chains that are going to extremes. The Cheesecake Factory’s (CAKE) Bistro Shrimp Pasta has an astonishing 3,120 calories and 89 grams of saturated fat. IHOP’s Country Fried Steak & Eggs—served with deep-fried hash brown potatoes and two buttermilk pancakes—has 1,760 calories. The Center for Science in the Public Interest, which calculated these “nutritional” values, notes that this is like eating five McDonald’s (MCD) Egg McMuffins sprinkled with 10 packets of sugar. Most of the dishes aimed at the Man v. Food-watching, Guy Fieri-following crowd are available for a limited time. That’s the best way to generate interest. “If the McRib was available year-round, no one would care,” says Oches at QSR. There is an added benefit to the limited-time offer: Restaurants are not required to disclose the calorie counts of those items, says NPD’s Riggs. The bottom line: America’s $161 billion fast-food industry has embraced rich, fatty, gooey extreme foods to grab diners’ attention. This entry was posted on Thursday, September 26th, 2013 at 10:21 am and is filed under Food, Future Plans/Announcements, Menu Development/Innovation, Menu Trends, New Product Tests/Mentions. You can follow any responses to this entry through the RSS 2.0 feed. You can leave a response, or trackback from your own site.